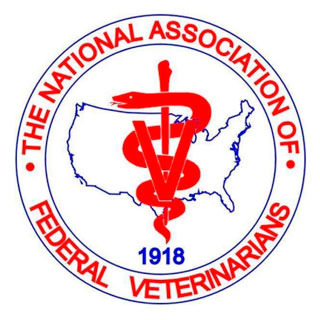 The National Associationof Federal Veterinarians (NAFV) is a constituent body of the American Veterinary Medical Association (AVMA), formed during the AVMA annual meeting in 1918 by a small group of Bureau of Animal Industry veterinarians. It has grown to approximately 1,000 members since, and is recognized by the United States Department of Agriculture as the representative organization for federally employed veterinarians and as an association of managers and supervisors. NAFV strives to serve both veterinarians and the agencies they work for by facilitating communication, making suggestions for improvements, and working collaboratively to address issues of concern. As an advocate for veterinarians in federal service, NAFV emphasizes professionalism and expertise in federal service, while promoting continuing education, teamwork, and a standard of excellence. NAFV is staffed by a full time executive vice president, junior staffer and general counsel. The board of directors is comprised of a president, president-elect, vice president, and secretary-treasurer, all elected by the members on two year terms, as well as board representatives from various federal agencies and the military. Policy is established by the board during its annual two-day meeting, on conference calls, and/or through email. NAFV’s general membership meetings are held twice annually in concurrence with the AVMA and United States Animal Health Association (USAHA) conferences/meetings. NAFV members also work on NAFV projects and task forces. NAFV has Chapters throughout the nation where members meet and discuss issues of concern as needed. NAFV also has held consultation meetings with the Animal and Plant Health Inspection Service (APHIS) and the Food Safety and Inspection Service (FSIS) to discuss management and supervisory issues with the purposes of improvement of agency operations, improvement of working conditions, exchange of information, improvement of managerial effectiveness, and establishment of policies that best serve the public interest in accomplishing the mission of the agency. Within FSIS, NAFV members are composed of public health veterinarians who are supervisors and managers that provide critical and valuable expertise and information to the agency in the development and implementation of food safety initiatives, agency programs, improvements in administrative matters and the functioning of the agency. Within APHIS, NAFV members are primarily Veterinary Medical Officers who manage and supervise the numerous national animal health (primarily livestock) programs, as well as the importation, exportation, and prevention of animal diseases, Veterinary Accreditation, and animal welfare. NAFV members also work to approve veterinary biologics, the Food and Drug Administration (FDA) initiatives, Department of Homeland Security and the Center for Disease Control (CDC) initiatives.